The giant gold ETF, GLD, reported yet another drawdown in its holdings this afternoon. This time around it was a 3 tons reduction bringing the total holdings to 715.26 tons. That is now up a mere 6.24 tons since the start of the year levels, a far cry from its peak in February of a 64 ton increase on the year. There is no way to spin this to make it the least bit friendly for the cause of gold. gold etfThe chart does not lie and as you can see, when the reported holdings of GLD were rising, the general trend in gold was higher. 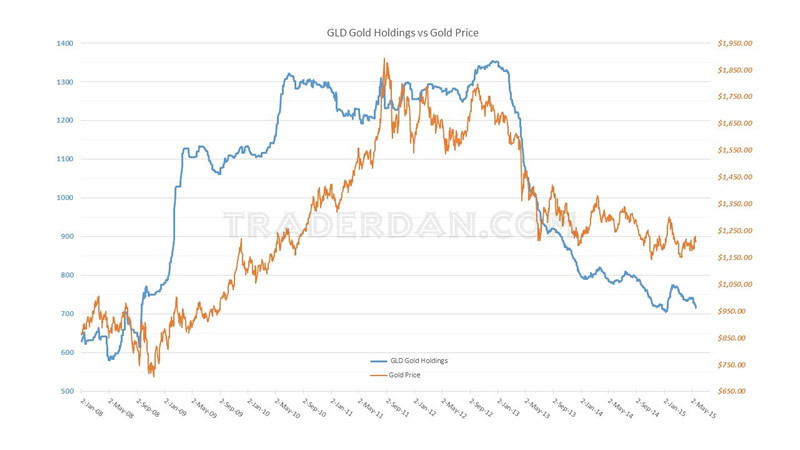 When the reported holdings are falling, the trend in the gold price is lower. I find it nothing short of intellectual dishonesty for some in the gold perma-bull camp to try to make this fall in reported holdings as somehow bullish. “The sun is rising – bullish for gold”. “The sun is setting – bullish for gold”. “Inflation – bullish for gold”. “Deflation – bullish for gold”. “Full Moon – bullish for gold”. “New Moon – bullish for gold “. In other words, everything is bullish for gold, all the time! Serious minded and objective traders and investors will rightly dismiss this foolish attitude but it is astonishing to me that so many gullible folks out there still pay attention to anything that some of these hucksters publish when it comes to gold. The spin on this continued fall in reported holdings is that: “some big entities are sourcing gold from GLD and that is bullish”. Now, how silly does that argument sound looking at the price soaring from below $700 all the way to $1900 as those reported holdings soared right along with the price! Here is the simple truth – this ETF, is a vehicle that was created in order to allow large ( and small ) investors who wanted to own gold but whose charter did not allow them to buy gold futures. Also, it allowed those who preferred to avoid the risk of having to be specific stock pickers and choosing individual gold mining companies into which they could invest client money to get gold exposure. Money managers and large funds and institutions welcome the liquidity in this ETF and as they can move into and out of it relatively quickly and easily. That being said, it has become a very good gauge of Western-based investor sentiment towards gold in general. Falling reported holdings is simply evidence that the sentiment of this crowd towards gold is deteriorating. My thinking on this is related to what has been happening in the global bond markets, but especially the US Treasury markets. Bonds have been selling off in spite of fears of slowing global economic growth and in spite of a massive ECB QE program currently underway. I have commented on this development extensively of late. Obviously something is at work here that as of yet is not completely clear. My own view is that there is a shift in sentiment occurring in regards to bonds among an increasing number of large entities. Whether through fears of a lack of liquidity from a grossly overcrowded trade, or through a growing consensus that the first rate hike by the Fed this year is inevitable, some are exiting bonds now while the going is good. “Why wait?”, is being asked more frequently when it comes to moving out of bonds. Traders/investors in GLD are looking at this and are seeing an environment down the road which many believe will not be especially friendly towards gold. The reason is simple and it has to do with REAL interest rates. Note – I am using the adjective, “REAL”, as opposed to NOMINAL interest rates. It is no secret that the current rate of inflation is too low as far as Central Bankers are concerned. However, with bonds moving lower, interest rates, especially on the long end of the curve are rising. With a low rate of inflation and rising yields, REAL rates are currently positive. Gold, in order to mount a sustained uptrend, requires NEGATIVE REAL RATES. Since traders are not seeing any signs of surging inflation at this point, there is no incentive to hold gold. Please do not take me to task for the above statement. I am merely giving you the thinking behind those who are selling gold and moving out of GLD. One thing which would work to short-circuit this thinking is if STAGFLATION were to take hold. I recently wrote a piece about that so please reference that if you need to refresh your memory. Such an environment would see NOMINAL interest rates rise as well but the rate of inflation would be outpacing the rise in rates resulting in NEGATIVE REAL rates. Gold would thrive in such an environment. This is the reason that I keep coming back to the priority of the interest rate markets as being the KEY to all the rest of the markets. Good trading to you all! Dan Norcini is a professional off-the-floor commodities trader bringing more than 25 years experience in the markets to provide a trader's insight and commentary on the day's price action. His editorial contributions and supporting technical analysis charts cover a broad range of tradable entities including the precious metals and foreign exchange markets as well as the broader commodity world including the grain and livestock markets. He is a frequent contributor to both Reuters and Dow Jones as a market analyst for the livestock sector and can be on occasion be found as a source in the Wall Street Journal's commodities section. Trader Dan has also been a regular contributor in the past at Jim Sinclair's JS Mineset and King News World as well as may other Precious Metals oriented websites.